I am so lucky to be one of the PTPA product testers to test out the Admiral Road personalized blanket. I want to thank you PTPA for giving me such an opportunity to take part in testing this product. Obviously, baby blanket plays a very important role in my baby's daily life. Not only that she uses it while she's sleeping, but she also needs it whenever we go out. When we took the blanket out of the package, we were all very excited! The blanket was very eye-catching. It has a monkey pattern on it with my baby's name sewed towards the bottom part of the blanket. I washed it right away so that my baby can test it out. After the first wash and after I put it in the dryer, it's still look like new (the colour did not fade, no thread tangling etc. and no shrinking) and it feels really soft (I did not use any fabric softener for the clothes and other things that my baby uses). I let my baby held it herself and she did not push it away (I had another blanket, after I washed and gave it to my baby, she did not like it and refused to use it! My baby did like to pick her own things!). I let her to use this blanket whenever she's in the living room, in her crib and whenever we went out. My baby likes this blanket a lot and I think as a mom, obviously, I would want to buy something that my baby loves! Then we went for a two days road trip to Niagara Falls. We used this blanket to cover part of her car seat to work as a sun shade while we were in the car. Then when we put her on the stroller, we used the blanket to cover her as it was still kind of chilly when we were close-by the Falls. The blanket was very handy and light weight and it served the function to keep my baby warm! 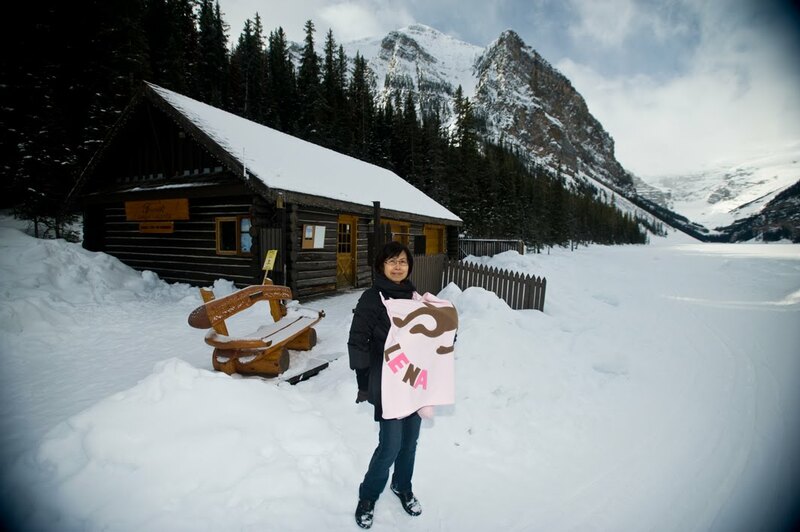 When we went back home, we washed the blanket for another 3 times before we brought the blanket with us again to another trip, Banff and Lake Louise in Calgary. We brought it with us on the flight so that when our baby was alseep, we could use it to cover her. Then in the rental car, again, it was used to cover her car seat and worked as sun shade. Since it was quite cold in Banff and Lake Louise, we used the blanket all the times. When we were holding our baby either by hands or using a baby carrier, we used the blanket to cover my baby's head and body to keep her warm and separate her from the wind (as it was really really cold at Lake Lousie, especially). The personalization on the blanket was really stand-out and eye-catching! It was also used to identify my baby in the picture even she was asleep and could not see her face! Overall, I love this blanket. The blanket's size is good and we feel comfortable for our baby to use it in her crib at night (for some baby's blankets, babies will soon outgrown it). When we folded it up, it's very light weight and handy to bring it with us to simply go anywhere. The quality of the blanket is really good and I have washed and dried it several times already and it still looks like new. My mom is really picky about the products/things that my baby uses and even after the Banff/Lake Louise trip, she says this blanket is really good to be able to keep my baby away from the wind and served as another protection to keep my baby warm! I have recommended it to a few friends already should they need to buy any baby shower/baby gifts for any expectant mom or new parents. We will be going to the States in two weeks and of course, we will bring this blanket with us as well! Disclaimer: The product/s mentioned above have been given free of charge from the company/PTPA. The product features expressed in this post are those of My Panda Space and have not been influenced in any other way.